DogeCoin – How a Joke Cryptocurrency has turned into a Brand. Dogecoin, which was originally a joke cryptocurrency based on the popular doge meme has successfully become a brand. While not at its high point, when the market cap of Dogecoin reached 100 million, the community that surrounds the currency hasn’t stopped promoting the currency in unique and helpful ways. To start, they raised over $30,000 to help send the Jamaican bobsled team to the winter Olympics. Not while this might not be a ton of money in comparison to what some kickstarter funds get, it is still a pretty high amount of Dogecoin that must have been spent to get it their (a Dogecoin is worth roughly ($.00506 ). 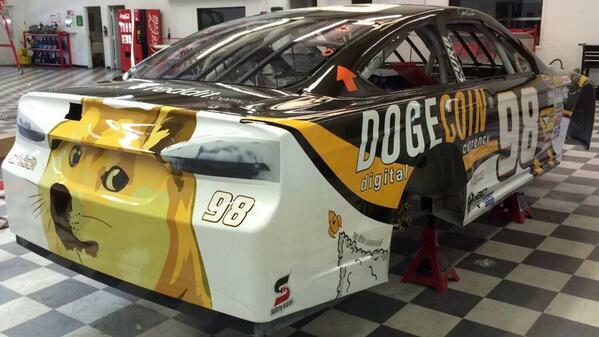 Other notable achievements of funds raised by the Dogecoin community include $30,000 to the Doge4Kids program The Doge Carwhich aims to send service dogs to families and kids in need, and they raised enough money to sponsor a driver at Talladega. The other nifty thing about Dogecoin is how easy it can be transferred. Dogecoin can be transfered in many ways that Bitcoin and Litecoin (its main competitors) can’t. The most popular of the ways to transfer Dogecoin is through a system of tips. On popular social websites such as Twitter and Reddit, a person can gain Dogecoin if they are tipped it. Normally tips are given to people who post interesting comments. This in turn, encourages people to make comments that are unique or helpful. In all, what has started off as a joke currency has started to turn itself into a brand. It is pretty awesome to see what the power of a social media community can do. I think this is just awesome, as doge has become huge; turning it into a brand has just made it that much better. Great concept and ideology behind it, along with what they do with the funds they obtain. This reminds me of the conversation we had in class about the currency on the game Second Life. However, there was a real exchange rate between real and game currency because you have to pay to play the game it is still really interesting. People were using Second Life as their actual full time job, creating graphic products that they sold and generated a game currency revenue from which could be exchanged for real currency. There was even a case of a glitch in the game where somebody was stealing “merchandise” and selling it at in game “flea markets” that resulted in a winning lawsuit in real life in which the plaintiffs were rewarded thousands of dollars on the loss of their products.